Drop into GRAM and explore GRAM’s latest installment of our Michigan Artist Series, Dylan Miner: Water is Sacred // Trees are Relatives, with one of our dedicated docents. In Dylan Miner: Water is Sacred // Trees are Relatives, Miner investigates the important historical and current issues around three primary natural elements: wood, water, and sky, and the traditional knowledge and beliefs around them within Great Lakes Indigenous cultures. For the exhibition, Miner will produce a series of large-scale cyanotype photographs on fabric that portray images of cloudy skies and water surfaces. For Miner, the blue color of the cyanotype process evokes water and sky, and also has symbolic correspondence to Michigan’s history around Indigenous issues of sovereignty. (The cyanotype process was first used in 1842, the year that the Treaty of LaPointe was signed, the last of the eight major treaties ceding land that is now Michigan.) Miner will also create site-specific sculptural elements for the exhibition from old growth timber and other arboreal materials. A Docent Guide will meet the group in the Museum Lobby 5 minutes before the tour start time. 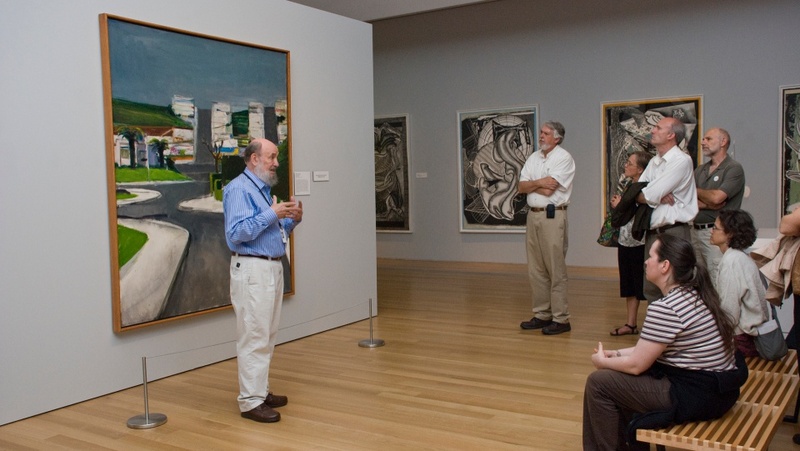 Drop-in tours are free with admission and require no preregistration.